The URL in the screenshot is not complete. Depending on the state of the program certain URL arguments are omitted. In perfect conditions about 40 arguments that describe the user's system, the µtorrent settings, and µtorrent usage statistics are sent to the server. Here's the list in order of how they would appear in the URL. Description: This value identifies the µtorrent version. I used version 1.8.5 Build 17414. The 0x4406 is the build number. I am too lame to figure out how 0x30B relates to 1.8.5. Description: When I said I'm only 90% done this is what I meant. I can't figure out a way to trigger this URL part. I know it relates to the "dw" setting of the settings.dat file but I can't figure out what setting "dw" is. Anyway, this value is probably another version identifier. In the forum thread I linked above there's someone who had the qv appear in his update URL. His value was the same as for the 'v' argument. Description: The first %d is the value stored in the 'version' file inside your utorrent.lng language definition file (which is really a ZIP archive). The second %d was always 0, no matter what I did. Looking at the assembly code I think it can be any value between 0 and maybe 4, I just did not manage to trigger other values because finding the right execution paths was too time consuming. The %U is the locale of the GUI language selected in µtorrent. Description: If the value is 128 (0x80) beta versions are considered when checking for updates. If the value is 0x00 only release versions are considered. I think there are other possible values (0x10, 0x20, 0x40?) but I did not manage to trigger them. Description: A language identifier as returned by the API function GetLocaleInfo(LOCALE_USER_DEFAULT, LOCALE_SISO639LANGNAME, ..., ...). Description: Of all the values I did not figure out this is the one I know least about. Description: A country name identifier as returned by the API function GetLocaleInfo(LOCALE_USER_DEFAULT, LOCALE_SISO3166CTRYNAME, ..., ...). Description: The return value of the API function GetVersion(). Description: 1 if Wine is detected by checking for certain registry keys. Description: A number that says whether the PC uses IPv6 combined with a check whether the user is running Windows Vista or higher. Concatenate the return values of QueryPerformanceCounter, GetCurrentProcessId, GetTickCount, and the number of seconds since 1970 into an array of 20 bytes. Create a SHA hash of that array. Use the SHA hash to modify a Mersenne Twister table that was previously generated with the constants found in this paper. Get a random 32 bit number (salt) with the help of the Mersenne Twister. Create a new 14 bytes array by concatenating the salt, the return value of UUIDCreateSequential, and the volume serial number of the user's C: drive as returned by GetVolumeInformationA. SHA-hash that array and overwrite it with the generated SHA-hash but start at position 4 so you do not overwrite the salt. SHA-hash the array again but without the salt (basically SHA-hash the SHA-hash from step 6). Once again overwrite the array with the hash value starting at position 4. Add the hashes generated in steps 7 and 8 DWORD by DWORD and prepend the unmodified salt. Store the value in settings.dat as the setting with name 'cid' (possibly Computer ID). 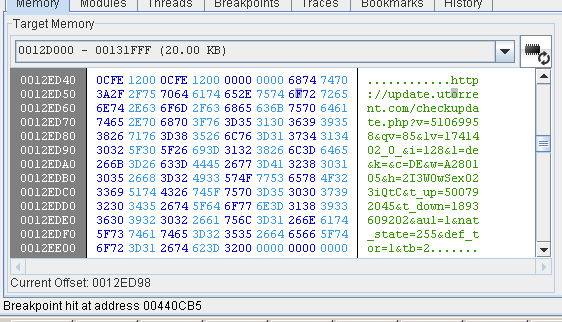 When checking for an update take the first 12 bytes of that 24 bytes value starting from position 4 (skip the salt). Base64 encode this value and add it to the URL. Description: I don't know, I could not trigger that value. Description: The total number of bytes uploaded to torrents since µtorrent was installed. Description: The total number of bytes downloaded from torrents since µtorrent was installed. Description: Configured maximum upload rate in KB/s. Description: Configured maximum download rate in KB/s. Description: 1 if Automatic Maximum Upload Rate is enabled. Description: 1 if Web Interface is enabled. Description: Number of configured RSS feeds. Description: Number of configured RSS feeds whose torrents are downloaded automatically. Description: The number of known torrents. Description: The number of downloading torrents. Description: The number of complete torrents. Description: The number of active torrents. Description: The number of inactive torrents. Description: The number of uncategorized torrents (No Label group in the GUI). Description: 1 if the scheduler is enabled. Description: Describes the network state. FF = Not connected; 00 = Not Connectable/Listen Error; 01 = No incoming connections; 02 = OK. Description: Total number of successfully established connections since µtorrent was started. Description: Couldn't trigger this no matter how many Linux ISOs I downloaded. Probably another outgoing connections stat. Description: Couldn't trigger this no matter how many Linux ISOs I downloaded. Probably another incoming connections stat. Description: Total number of established incoming connections since µtorrent was started. Description: Creation date of settings.dat in seconds since January 1st 1970. So basically the installation date. Description: 1 if µtorrent is the default torrent client. Roughly a million registry keys are checked to verify this. Description: 1 if the Yandex toolbar is installed, 2 if the Ask toolbar is installed (and properly configured; once again checking a million registry keys). 3 if both toolbars are installed. The good news is that we are done now. The bad news is that there is not just update.php but also installstats.php and updatestats.php which both take lovely argument lists with different argument values. I have also had a brief look at the upcoming µtorrent 2 beta. That version is sending out even more data. I leave all of that (and the settings.dat entry 'cid2' which is another computer identifier value) as an exercise to the reader. Oh yeah, there is a setting in the preferences dialog (Send detailed info when checking for updates) where you can disable all of this data sending. However, it's enabled by default so your data is sent out at least once when you first start the program. You said "your data is sent out at least once when you first start the program." That's only the case if you are connected and your firewall lets the program do this! By the way, you included an screenshot. It seems that you are debugging uTorrent. May I know the name of the debugger? of course you're right with the connection/firewall point you made. The debugger is BinNavi. Check http://www.the-interweb.com/serendipity/index.php?/archives/126-Debugging-emulated-Cisco-devices-with-BinNavi.html for other screenshots. I've never heard the name of `BinNavi' before. At first, I was really interested to get to know it---But, OMG, it's very costly. IDA Pro is $400-$1000 (if I'm not wrong), but this add-on costs over $4500. Anyway, thanks again for introducing this invaluable debugger. You could alway use something like WireShark if you are just wanting to see what data stuff is sending out on the network from your computer. So did you have 'send anonymous usage statistics' checked while testing utorrent? If you did then these are sent when updates are checked which is a decent system of only sending it when you are already connecting to their servers. This puts two useful tools for them into one service. You opted into this, get over it. If you didn't have it checked then this is horrid and I'm glad I already switched to deluge. As explained at the end of my post, the data is sent with the default settings you have to opt out of. do other torrent clients or agents also have this? I have no idea. I have never taken a look at other clients. Don't you think that the infos uTorrent is sending home is still less then you send to the google servers while a single search? !